I spent part of my time “up north” staying with friends in Baltimore. Chana not only bakes her own challah every week as I do, she gets wheat and spelt directly from the farmers, sprouts it, dehydrates it amd mills the flour herself. I have been doing it the easy way and buying flours at the grocery store. 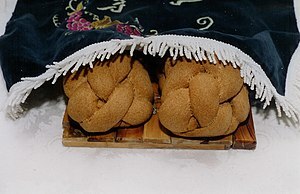 I could not believe the extra level of work 9and equipment) that she takes for granted as part of the weekly process she begins about tuesday or even Monday to have her Shabbos challasready for Friday night! Let me know if you want info on this process!